A novel DA - RCM - ROM Cascade reaction was described recently giving easy access to a group of complex tricyclic molecules called triquinanes (Nguyen et al. 2010 DOI). Reaction of alkyl tosylate 1 with cyclopentadiene and sodium hydride gives tetra-alkene 2 as a mixture of 2 isomers. 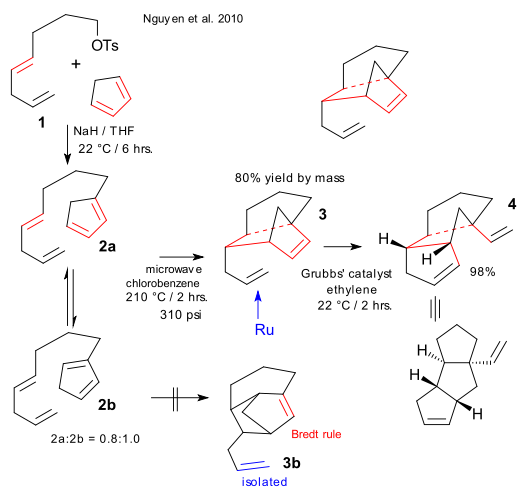 The first step in de cascade is a high-temperature intramolecular Diels-Alder reaction of 2a to 3. No direct DA pathway exists for 2b because the formed double bond would violate Bredt's rule but isomerisation to 2a (T=210°C) is the alternative. The second step in the cascade an olefin metathesis to 4 using Grubbs' catalyst and ethylene with both a ROM and a RCM component and the question arises: which one is first?. 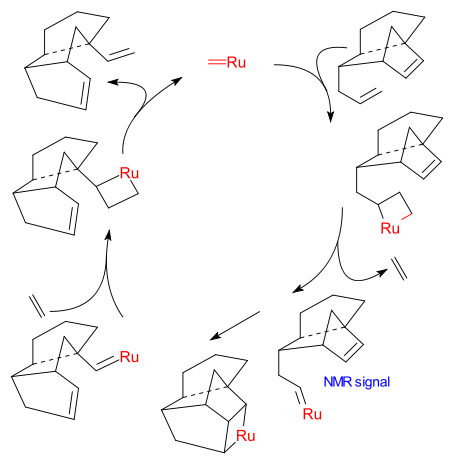 Nguyen settles for a mechanism in which the ruthenium alkylidene attacks the allyl double first, the key Ru complex shows up in low-temperature NMR and in an competition experiment n-hexene beats norbornadiene 6 to 1. This result is counter-intuitive (hence the exclamation mark in the publication's title) because initial attack of the Ru complex on the norbornene alkene would be driven by release of ring-strain.